Honey Sriracha Grilled Shrimp an easy 30 minute meal or appetizer. 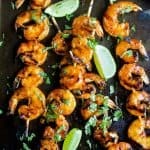 These are hands down the BEST grilled shrimp you’ll ever have and the Honey Sriracha Glaze is swoon worthy! Soak the wooden skewers for 20 minutes before grilling. Place prepared shrimp on wooden skewers. Place shrimp skewer on the grill. Grill for 3-4 minutes, until the shrimp releases from the grill. Flip the shrimp over and grill on the other side for 4-5 minutes. Using a brush, gently brush the honey sriracha glaze on both sides of the shrimp. Grill each side for one more minute. Glaze the shrimp one last time. Garnish with lime wedges and fresh cilantro.